Slocum Gliders are autonomous underwater vehicles that navigate ocean waters collecting data at various depth levels approximately every second for multiple parameters. Parameters include Temperature, Salinity, Dissolved Oxygen, Dissolved Oxygen Saturation, Chlorophyll 'a', and Depth. Data is collected from surface to bottom, east to west, and north to south providing a detailed three-dimensional view of ocean conditions. 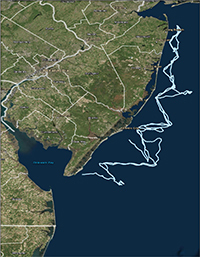 Since 2002, the New Jersey Department of Environmental Protection's (NJDEP) Integrated Water Quality Assessment Report has listed NJ's Ocean waters as impaired for Dissolved Oxygen (DO). To more effectively comprehend ocean dynamics and to determine if low DO levels are natural or from anthropogenic inputs, the use of continuous slocum glider data acquisition technology is being applied. Through use of both glider and ocean benthic community data, an in-depth assessment of our Ocean's ecological conditions are underway. 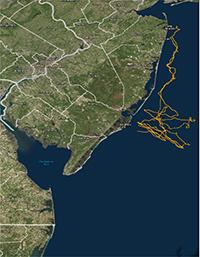 A larger, more comprehensive data set that can be used to either support or contradict NJDEP's Integrated Report listing of NJ ocean waters as impaired. Evaluate whether chemical ocean impairments coincide with biological ocean impairments using a newly developed Ocean Benthic Index. Gain a better understanding of monthly stratification of ocean waters and its effect on DO. Share Temperature data with Rutgers University and National Oceanic and Atmospheric Administration (NOAA) hurricane forecasters for Tropical Storm intensity forecasts. Acquire a larger range of data to analyze annual variability and its effects on ocean biology. Acquisition of data from NJDEP's Slocum Glider would not have been possible without funding provided by the Environmental Protection Agency (EPA). 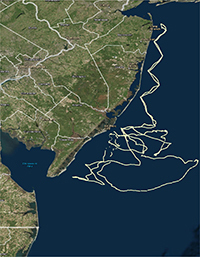 In 2012, the EPA made available through S106 Monitoring Initiative funds, the ability for NJDEP to purchase the Slocum Glider. In addition, the assistance of Dr. Josh Kohut from the Marine and Coastal Sciences department at Rutgers University has been critical to all of our Glider deployments. His technical expertise for calibrating, deploying, maintaining, and retrieving the Slocum Glider is essential to successfully implement all phases of the Slocum Glider missions.